The poor heroine of today's Furniture Flippin' feature didn't stand a chance. Julie of Alchemy Vintage Market was exposed to a bug early on. She can thank her grandmother and her mother for that. For it was the two of them together that exposed her as a child to junkin'. Not only did they teach her all about it, they expertly taught that little girl how to jam pack a red 1972 VW Bug FULL of junk. Picture it! They'd take her to garage sales and thrift stores. Then the three of them would pack Grandma's Bug with their finds. The ramifications of their junkin' trips had far reaching and long lasting effects. Not only did they pass this onto her, she then became a carrier and passed it on to her four children. They, too, are a bunch of junkin' junkies. Do you know that Julie still frequents the same stores she did as a child? (I'm not even sure it's wise to assist her in her addiction by featuring her today, but I will. If I don't, she'll just go elsewhere and who knows where she'll end up. I can't have that on my conscience!) 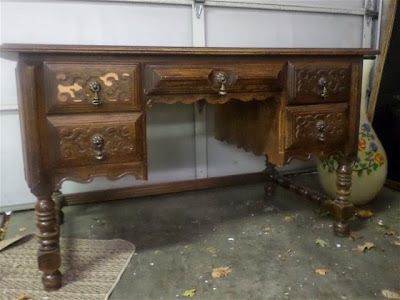 Let's take a look at a desk she found on one of her "trips" to a local Goodwill. I'm going to let Julie tell us about this makeover in her own words. I will be providing commentary in (parentheses). Okay, it's Stephanie now. I'm only allowing her so much time to take over. 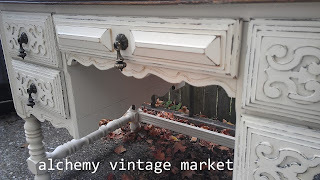 You give a junkin' junkie an inch, they'll take the whole dang ruler AND trim a table with it! 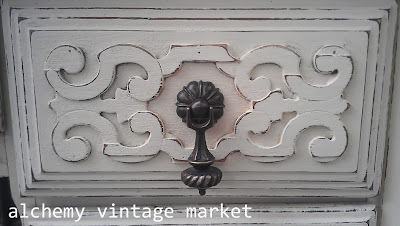 Julie primarily mixes her own chalk paint. She got her wish with this one and painted it the country white. She distressed it in all the right places and waxed it. She left the top original and the hardware the way she found it. Let's take a look at the after. It. Is. Gorgeous. I bet you'd like to own that desk, wouldn't you? You're probably just like Julie, aren't you? Well, I'm hear to tell you that you CAN'T own it! It's just not possible. This isn't tough love here. This is me telling you that it SOLD a few weeks ago. That's right. It's done been bought up. That being said, I hear that you can contact Julie on her Alchemy Vintage Market Facebook page. 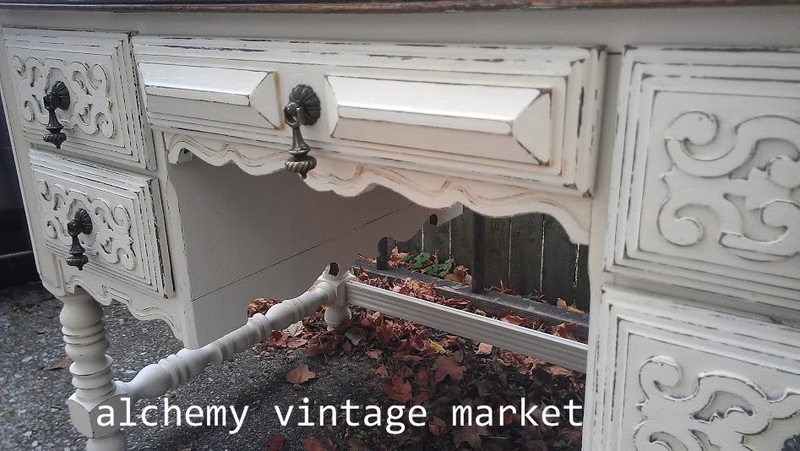 That's one of the places where she peddles her wares. 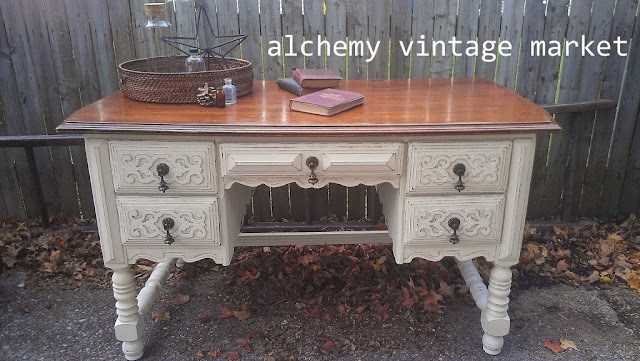 Alchemy Vintage Market is based in Fort Wayne, Indiana. Head on over there and let her know you saw her on Furniture Flippin'. Oh, I meant her Facebook page, not Indiana. Thanks Julie for sharing your fabulous furniture flip! Okay dear readers. Who wants to talk back today? There's a comment section on this blog. So, quit being so quiet. I get bored just reading my own stuff. (Not really. Hehehehe...but I do like to mix it up a bit from time time.) One last thing, did you submit YOUR flip yet? Quit stalling. Email me before/after pictures and a lot of really good details to furnitureflippin@yahoo.com . I'll be waiting. Thank you Stephanie for the fantastic shout-out!! I'm enjoying your page and am a new fan!! Sooo pretty. And I'm from Fort Wayne also!! Double points.